Ten years later, the thunder of drums and the thrill of the competition are still filling movie theaters as "Big, Loud & Live," the live broadcast of the DCI World Championship Prelims, is set to return to cinemas nationwide, Thursday, Aug. 8. In partnership with NCM Fathom Events, this year's event will mark the 10th anniversary of the program, which has grown steadily since its debut in 2004. Appearing in just 44 theaters in that first year, the event spread into a record-setting 609 theaters across 47 states in 2012. More than 43,000 attended last summer's cinema event. Over the past decade, fans have come to expect excitement from the theater event, and this year will be no exception, according to Shelly Maxwell, Executive Vice President of NCM Fathom Events. "DCI fans have displayed their loyalty and enthusiasm for this spectacular series over the last 10 years, and we guarantee another year of rousing, foot-stomping, hand-clapping drum corps entertainment," Maxwell said. 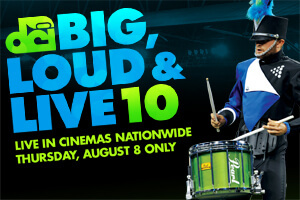 "Big, Loud & Live 10" will be shown in more than 620 cinemas across the country on Thursday, Aug. 8 beginning at 6:30 p.m. ET (3:30 p.m. PT), through NCM's exclusive Digital Broadcast Network. The broadcast is scheduled to last just over five hours, allowing time for fans to view the top 15 corps' full World Championship Prelims performances, plus additional highlights from other corps that performed earlier in the day. "We're very pleased to be able to share the evening with tens of thousands of fans in cinemas across the country, many of whom have made this into an annual tradition when they're not able to travel to the World Championships in person," DCI Executive Director Dan Acheson said. "The only thing better is to be there to see and hear it live!" Tickets for this one-night cinema event are currently available at participating theaters' box offices, or online at FathomEvents.com.